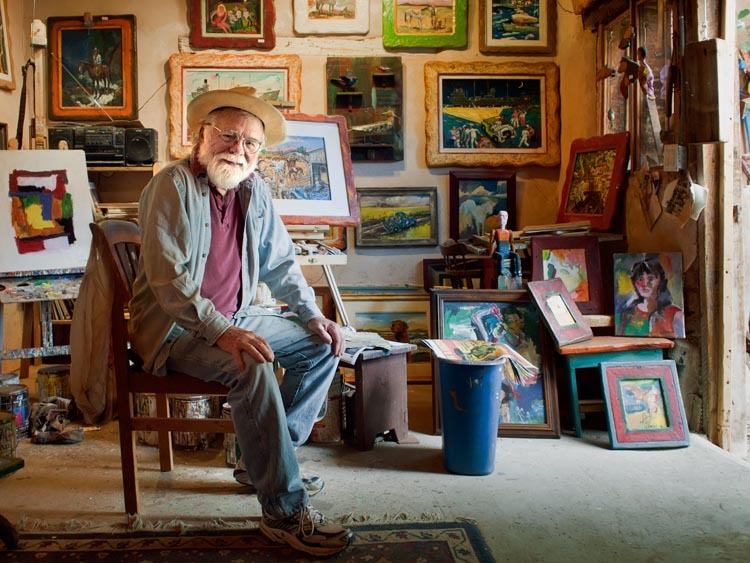 ​Edition ONE is delighted to invite our long-time friend, world-class folk-artist and raconteur, Ed Larson, for a one-man show in a gallery with even more history than his former stables up the road. For two, glorious, probably cold, definitely colorful, months we will be showing Wonderful Ed’s Western Art and Whimsical Sculptures. Come inside to see Ed’s art, share some hot cider or cocoa, sit with Ed by a cracklin’ fire, and hear stories of the fascinating characters that have come through Ed’s 87 years of life - 30 of them spent here in Santa Fe, 20 of those 30 on Canyon Road. Ed Larson was born in 1931 in Joplin, Missouri. He went to school there and then got swept up in the Korean War. He joined the Navy. He served on two ships in both the Sixth and Seventh Fleet, including a tanker called the USS Kankakee, this was a WW2 veteran that was built in 1936 for Esso, this ship was a home for trouble makers and problem sailors…Ed fit right in…After a year and half aboard the Kankakee he managed to go to Journalist School at Great Lakes and was assigned to a cruiser, the USS Bremerton. He got his first professional art job illustrating the cruise book for the USS Bremerton in Tokyo. After a twenty-year career in the Navy from 1950 to 1955 (“It just seemed like twenty years!”) he attended the “old” Art Center School on 33 West Third. Ed graduated from the Art Center College of Design in Los Angeles in 1958. “Prepped’” for a career in Advertising, he left for NYC in the middle of a recession and wound up working in Philadelphia for the agency N.W. Ayer. Then he worked for several agencies in Chicago including the well-known Foote, Cone & Belding. He was a traveling art director for the next several years, with a spell of employment working for Marvin Glass. communication at the Art Institute was an up and down world during the “Days of Rage,” in Chicago. The Riots around the 68 Election happened right out in front of the Chicago Art Institute and this happening changed the attitudes of young people, especially students destined for a career in corporate America. It changed the world for Ed too. He began considering being a part of the back to land movement and began to insert his political viewpoint into his art. Captured by the vitality of folk art work Ed began designing quilts and searching for quilters with whom to collaborate and quilt his designs. Subsequently Ed led workshops across the country where he taught quilters how to create their personal stories in picture quilts. At this point, when a fire in a one block long building in Chicago destroyed much of Ed’s work, Ed decided to relocate to Santa Fe, New Mexico. His close friend LD Burke had made this change. Why not try the world of the Cinco Pintores and the Taos Art scene? Ed, a resident of Santa Fe now for 30 years, is a big part of that scene. A master of mediums - painting, sculpture, wood carving, quilts - his works embody story, whimsy, and a point-of-view. An avid Western history buff, Ed loves to paint classic scenes of cowboys and horses in action. He has a large body of narrative paintings, some of homespun humor and heart, others about politics and celebrity from Billy the Kid to Abraham Lincoln, including paintings of his time in the Navy, bawdy nights in Paris, working the wheat harvest in Western Kansas, memories of his youth with Joe Beeler, Mickey Mantle, and scenes of Louis Armstrong performing in San Francisco. He creates whirligigs and sculptures, using found objects and combining them with hand-carved forms: women, horses, birds, goats and bears and large fish, six to twelve feet in length…in memory of the large pike plugs he can recall seeing in his father’s tackle box. One of Ed’s Quilt Collaborations was purchased by The Smithsonian, and he has produced a book called “Picture Quilts”. Ed Larson’s work has been featured in a number of exhibitions and is included in private, corporate and public collections around the country. Almost every piece tells a story – and Ed still has a lot to tell!